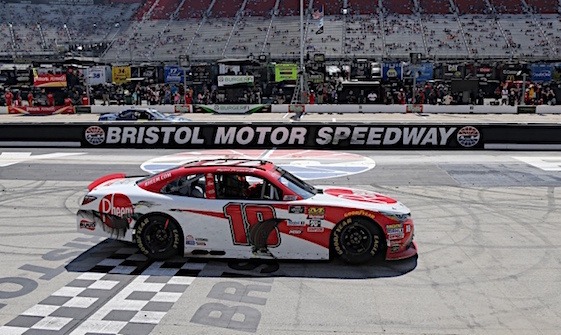 BRISTOL, Tenn. – A Modified champion and short-track star, Ryan Preece knew he possessed the talent needed to succeed in NASCAR’s top touring series. He simply needed a chance to prove it. That chance came last year, but only because Preece possessed a strong belief in himself and the passion to make a childhood dream come true. Preece took a calculated risk, or a gamble to some, borrowed money and purchased a two-ride deal in the NASCAR Xfinity Series with Joe Gibbs Racing. He had competed in the Xfinity Series before, but in under-funded equipment. The Berlin, Conn., native knew he had to make those two races with JGR count and he did, finishing second to Kyle Busch at New Hampshire and then winning Iowa, both in July. He brought sponsorship to JGR for the September Kentucky race and JGR rewarded him with a ride at Homestead last November. In those four races, Preece never finished lower than fifth. On Saturday at Bristol Motor Speedway, Preece parlayed last year’s gamble into a $100,000 bonus. And there was no controlling his jubilation. But why should he? He gambled and he won – big time! He became the first winner this season in the Dash 4 Cash and his winnings would allow him to pay off the debt he incurred last year. In Saturday’s Fitzgerald Glider Kits 300, Preece led four times for 39 laps, battling Brandon Jones down the stretch for the victory. In the final 15 laps, the two exchanged the lead three times with Preece snatching the No. 1 position for good with 10 laps remaining. Preece’s plans call for him to remain in the Charlotte, N.C., area through Monday and then he’ll return to Connecticut to resume working on his Modified. The 27-year-old Preece has won already in his Modified this year, claiming the Richie Evans/Ted Christopher Memorial 100 in February at New Smyrna (Fla.) Speedway during the World Series of Asphalt Stock Car Racing. And that’s where his focus will be, on his Modified, until July when he once again pilots an Xfinity car. Preece doesn’t consider himself a role model for drivers competing with under-funded equipment, but he doesn’t mind if people want to give him that label. Saturday’s victory wasn’t Preece’s first at the tough half-mile Bristol track. He’d won there previously in his Modified; but this one certainly was his sweetest.